Ficus benjamina is certainly one of the favorite plants all around, and deserves to be taken care of diligently. Here are our tips on growing a nice ficus tree and avoid diseases. 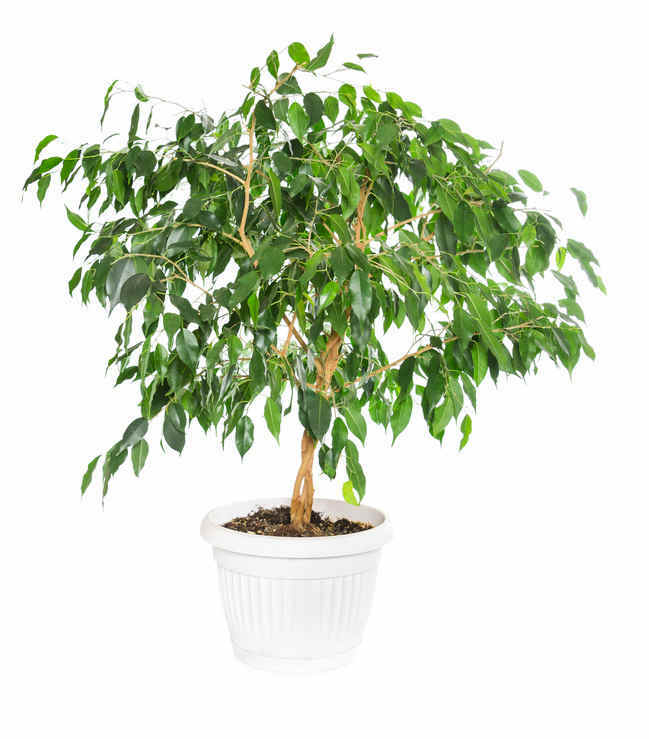 This Ficus is the most common indoor shrub. It is appreciated for its aesthetic appeal but also for its highly adaptive survival traits that let it thrive in the most varied settings of our homes, apartments and offices. 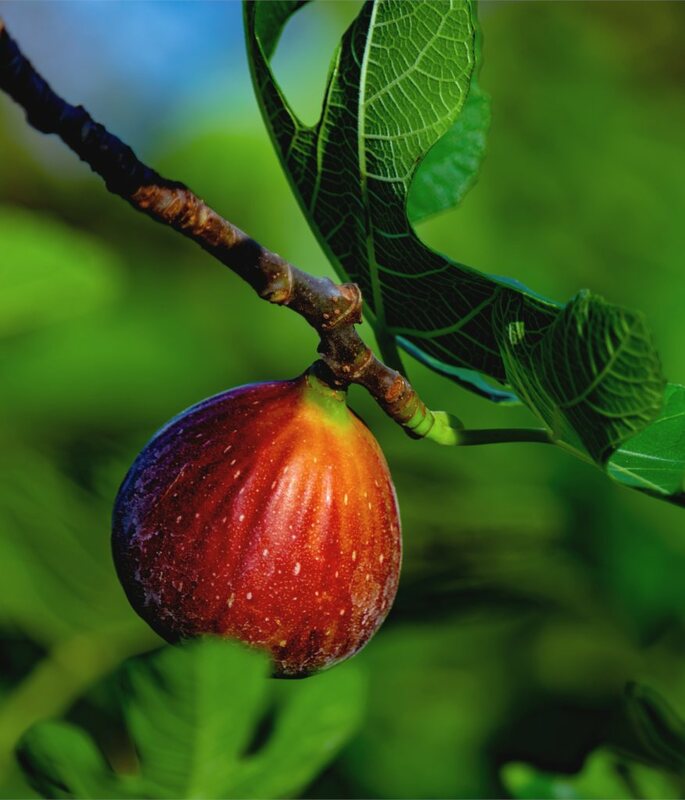 The term Ficus means fig and there are over 1000 different species that have evolved into different shapes, some of them shrubs, some of them trees, and others closer even to vines. 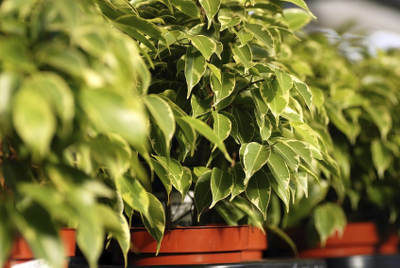 In the Western world, about two dozen varieties are available for sale for indoor use, and the most common and famous of these is Ficus benjamina. But also interesting is the Ficus elastica, known under the name rubber ficus and also Ficus retusa, often grown as a small bonsai. Once properly settled in and if it isn’t disturbed too often, the Ficus tree is a plant that is relatively easy to care for. Ficus is only picky as regards its exposure, its watering and must be guarded against rapid changes in temperature. It must be set in a luminous room but cannot be exposed to direct sunlight. Watering is needed when the soil is dry, but without overwatering and always with water at room temperature. Lastly, avoid moving it too often, since this tree needs time to adjust to its new setting. After having purchased your ficus tree, it is often preferable to repot it immediately. You’ll have to repot your ficus tree every 2 or 3 years when the pot grows too small. 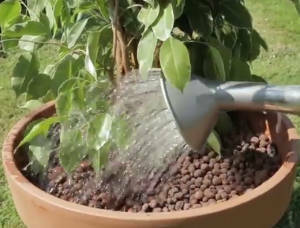 Here is a video on how to repot your ficus tree. Ficus trees are vulnerable to mistakes made while growing it, and to certain insects and parasites. Here are the main mistakes that must be avoided and how to treat a diseased ficus tree. Quite common for ficus trees, this is normal as long as the loss is regular and not too many leaves are falling. 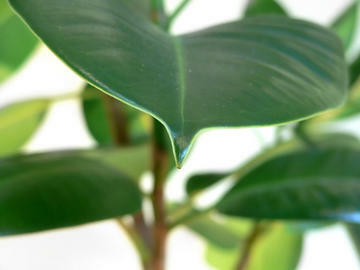 If your ficus lost its leaves, check that it is well watered, and eventually proceed to topdress the pot. This may also be connected to a change of pots or of place. It may also lack light, in which case you must provide more light to it. Finally, the ficus tree hates drafts and that may be enough to cause it to lose its leaves. It should quickly bounce back more vigorous than ever. This is often caused by a mite attack. Avoid other chemical products, especially for an indoor plant. This is usually due to mealybugs or scale insects. The ficus tree’s leaves are covered in sticky white blobs. These are whiteflies. Shower off your ficus in the bathroom, that should solve the problem. But if you can’t move your ficus around easily, spray water on the leaves once or twice a day until the whiteflies disappear. Its preferable to wait for the soil to have dried up before watering again. Consequently, water on average once a week. If the air indoors is quite dry or if it is summertime, it’s possible to water more often, but always wait for the soil to have dried up in the surface layer. Of course, in winter or if surrounding moisture levels are high, you may space the watering somewhat. Feel free however to mist the leaves on a regular basis, this will increase leafage quality and keep the leaves from drying up. Many seem to say that Ficus trees hate pruning; actually, the opposite is true: ficus bears pruning very well. 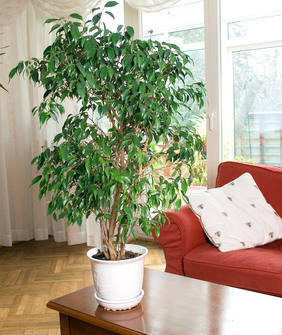 If it has grown too tall, or has invaded your living room, simply prune the ficus tree. You can prune once a year in any particular season. No need to cut the tree back severely, light pruning is enough. It will help the foliage grow more dense and beautiful. With a pot or garden box and regular topdressing, your Ficus benjamina can grow to reach a magnificent 6 to 10 feet (2 to 3 meters) tall!